Hello to all of Arlene's faithful readers! Let me introduce myself, I am Alan, Arlene's husband and partner in our off-grid adventures! First, let us apologize for it being so long since the last blog entry, we have been busy since that post, but with larger projects that take awhile to complete, such as painting the living room floor. Not very exciting to blog about. Plus, we have both been busier than usual with client projects. Right now Arlene is busy getting ready for our annual 'Turkey Palooza'!!!! Each year, for quite a few years now, we have rented a large house for the entire family to gather for Thanksgiving. Often friends join us for at least part of the week's events, which includes LOTS of board games, 'Cheese Races', and an annual Food Network style cooking competition. We leave tomorrow morning to head back north to finish preparing, and won't be back 'off-grid' until the end of the month. So, with much to get done before we leave in the morning, Arlene asked me to take over the blogging for this entry. Without further ado, I give you Mr. Wizard's Workshop! This entry will be some of my geek exploits, some successful, some not so much, but hopefully all entertaining. What Lassie? Alan's phone is down the well?!! Ever since we got our well operational, I have wondered what was down there. Visions of giant caves, perhaps with dark unseen creatures, or veins of gold or diamonds ran through my head. Each morning I draw 3 to 5 buckets of water from the 120 foot well, and one morning something grabbed the bucket on its way back up! Shivers ran up my spine, expecting at any second a tentacle to writhe up from the well. Like a good fisherman, I lowerd the bucket a bit, then rapidly hoisted it up, trying to 'set' my catch. But alas the bucket rose without further problem, guess it just snagged on the side of the well casing. So my curiosity got the better of me, and I decided to take my brand new Samsung Galaxy SIII phone and strap it to the bucket and lower it into the depth of the well while in video record mode. Yes, a risky plan, but the rewards could be astronomical! Arlene thought it brilliant too (once she stopped laughing), or at least that is how I interpreted the look she gave me. The video is long, about 10 minutes, just to get to the bottom. I shot a faster descent, but it was just a blur. I believe that the resulting video would be fascinating to a geologist, but not so much to the rest of us. The first few minutes is a nerve rattling view of the sides of the plastic well casing, such drama! At one point you will even be gifted with a view of a seam where two sections join together! And then, oh my goodness, its hard to speak of it, ROCK! In all its hideousness, the rest of the video looks just like I imagine my colonoscopy would look like. Unless I had told you where I had actually sent my phone, well, you would think it was someplace else. Watch for some of the denizens of these depths; at one point I thought I saw some yellow snails, probably poisonous, and I think a dead fly too. And once you see the ooze pouring down the sides of the well, like some beast leaking its life fluids, you will wonder how we drink this stuff. The answer is lots of filtering. My dialog has to have your anticipation at an all time high, so here is the video! Oh, did I mention the bucket spins a bit? I rode my bicycle past your... well, nowhere actually. 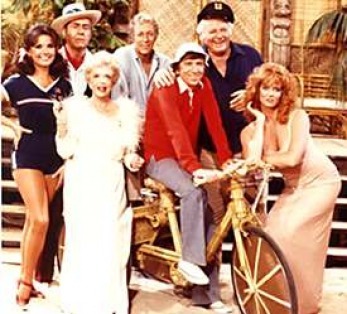 Do you remember this from Gilligan's Island? The professor built a stationary bicycle connected to a generator so that Gilligan could pedal and make power for their radio. 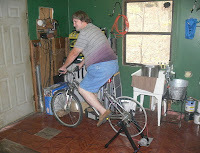 Notice how my new bike was going nowhere fast, on a trip all by itself? 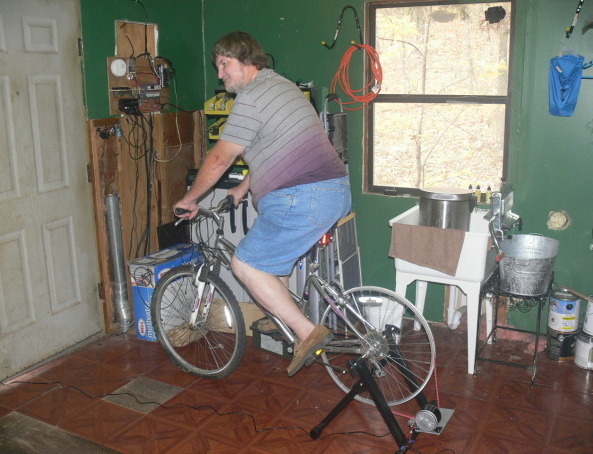 You have probably seen electric powered bicycles for sale. Sort of like a battery powered moped. Just add an electric motor, connect it to a battery through a throttle, and viola!, you have an electric bike! But in this case that does not accomplish much, I want to put power INTO the batteries, not take it OUT! If I could jump on the bike quickly enough, and get my feet racing fast enough to catch up with the pedals, then pedal faster, well then all would be good. More likely I would kill myself. 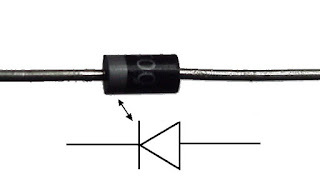 So a trip to civilization and a Radio Shack was needed to get a hefty sized diode. 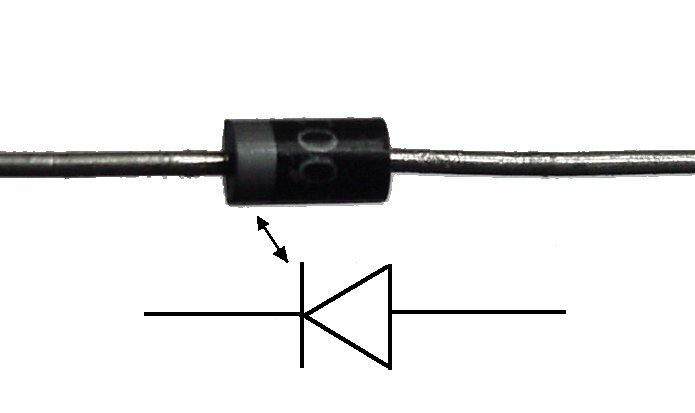 A diode is an electronic valve for DC circuits, it will allow electricity to flow only in one direction, apply positive voltage to the side without the band, and it goes right through. Apply it to the other side and it is blocked. Adding this between the bike generator and the batteries prevents the battery power from getting to the generator and running it like an electric motor. You see, there is no difference between a DC motor and a DC generator, same device; apply power and its a motor, spin it manually and its a generator. So here is how it is supposed to work! A Watched Pot DOES Boil! Now that we have a propane stove, it is very convenient to boil up water for coffee or tea. But we still need to be economical on our propane use. So I decided to compare our options to see which used less gas. We have a tea kettle, a basic pot with lid, and a Kelly Kettle.The Kelly Kettle is an aluminum chimney with dual walls that operates like a rocket stove.As the heat is drafted up the chimney, it gets lots of contact with the aluminum and heats the water. While designed for use with an open fire, I had high hopes it would work well on a stove top. Even using a tin cup to trap the heat in the chimney, the Kelly Kettle was a poor choice. The pot was almost as fast as the tea kettle. So, if inquiring minds wanted to know, tea kettles win! Side note: I also tested the Kelly Kettle using its intended open fire (wood scraps) against the tea kettle that was being heated with another small rocket stove. The Kelly Kettle again lost the race. Most solar electric systems that you may come across have a common feature; the storage batteries connect to a device called an inverter, which converts the 12 volts of DC power into the same thing you find in most homes, 120 volts of AC power. The reason for this is that most people really like all the AC devices and appliances they grew up with, and do not want to give them up. But... inverters are very inefficient. A lot of the solar power that was stored is lost in the conversion process. So Arlene and I made an early decision. While we do also have an inverter, it is for extrememly limited use, only for situations where we can not find an alternate means of doing something on 12 volts DC. Otherwise, every electrical device we have runs on 12 volts DC, directly off of our batteries (well, okay, through our charge controller to protect the batteries from being depleted too far). Our television runs on 12 volts. Our laptops, printer, and computer monitors all run off 12 volt DC-to-DC power converts. And, the point of this section, all of our lights run off of 12 volts DC. We wanted to use the existing light fixtures and wall switches in the house, so we needed 12 volt DC light bulbs with standard screw in bases. Fortunately the RV industry comes to the rescue, since RVs are all powered by 12 volt DC batteries. There are three choices: incandescent, compact florescent, and LED. Obviously we want our stored power to last as long as possible, nothing worse than suddenly finding yourself in the pitch dark because you used too much power. That brings us to the topic of power vs. light. Most people think of the brightness of a lightbulb based on its wattage. This is because during the majority of the life of electric lighting we only had one usual choice, the incandescent lightbulb. The amount of power that a bulb used, measured in watts, is what your electric bill is based on, the more watts you use, the higher your bill. And the more power, or watts that are used by a light bulb, the brighter it shines. So people got used to measuring the brightness of a light bulb in watts. Technically wrong, but it worked for so long. Now that we have options, we need a way to compare apples to cumquats, of incandescent to LED or compact florescent. 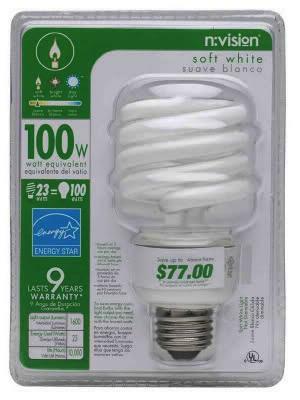 Next time you are at the home improvement store, look at the package on a compact florescent bulb, you will see it hyping how few watts it actually uses, and then say its brightness as compared to an incandescent bulb. Notice that the bulb in this pictures is 'as bright' as what you would expect a standard incandescent 100 watt bulb to be, but it only actually uses 23 watts. So, for our 12 volt solar system, we know that we want the brightness to be what we are used to, but we also want the actual power consumption to be as low as possible. While we could use 12 volt incandescent bulbs, we won't because they are so inefficient and use so much power. Leaving us to choose between compact florescent or LED. LED have a few advantages; they are not fragile, contain no mercury, last very long, and light instantly and do not need to warm up. Turns out they are also much more efficient in power usage. Now, not all LEDS are created equal. We visited a few alternative energy shows/expos and researched a lot. Early and easily obtainable 12 volt DC screw in light bulbs pull almost the same amount of power as the compact florescent bulbs. But, advances in LED design have resulted in some very efficient products. Finding them is the hard part, so let me save you some time... LCLED.com sells two bulbs that we highly recommend, a 75 watt equivalent bulb and a 50 watt equivalent bulb. 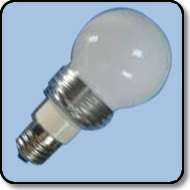 Compact florescent - 60 watt equivalent uses 15.6 watts of electricity. LED - 75 watt equivalent uses 7.2 watts of electricity. 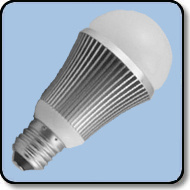 LED - 50 watt equivalent uses 4.8 watts of electricity. On our single bulb fixtures we usually go with the 75 watt equivalent bulbs, and on our 2 and 3 bulb fixtures usually the 50 watt bulbs. Well, I hope you have enjoyed your visit to Mister Wizard's Workshop, thanks for letting me be your guest blogger today!